Just Like not all transportation companies are the same, not all CNG companies are the same. At EVO CNG our years of experience in the transportation industry mean that we understand what you need to be able to keep your company running. Our partnership with Trillium CNG means we also have unmatched experience in the station building, maintenance, and operations department. We think the difference is clear. See if you agree. All EVO CNG stations are built specifically to accommodate Class 8 trucks with trailers. EVO executives have over 40 years experience in the transportation industry. That means we know what trucks and truckers need at their stations and the room that trucks take to maneuver. We build our stations to be able to handle the continued use and abuse that they will take on a daily basis. All EVO CNG stations are built to be ultra fast fill. EVO understands the pressures that transportation companies are under with all of the regulations, hours of service and driver shortages that face the market. We build our stations to be able to get a driver their fuel quickly and get back on the road. EVO CNG is the CNG truck expert. EVO executives owned four Freightliner truck dealerships and have delivered nearly 1000 CNG trucks to customers nationwide. We continue work with one of the largest truck dealership groups in the nation in an advisory role. This gives us all of the latest information on trucks, fuel tank packages, and trends and pricing. We can put together truck and station packages for our customers making us a true one-stop shop for all of your CNG needs. EVO CNG has the best Operations and Maintenance team in the Industry. 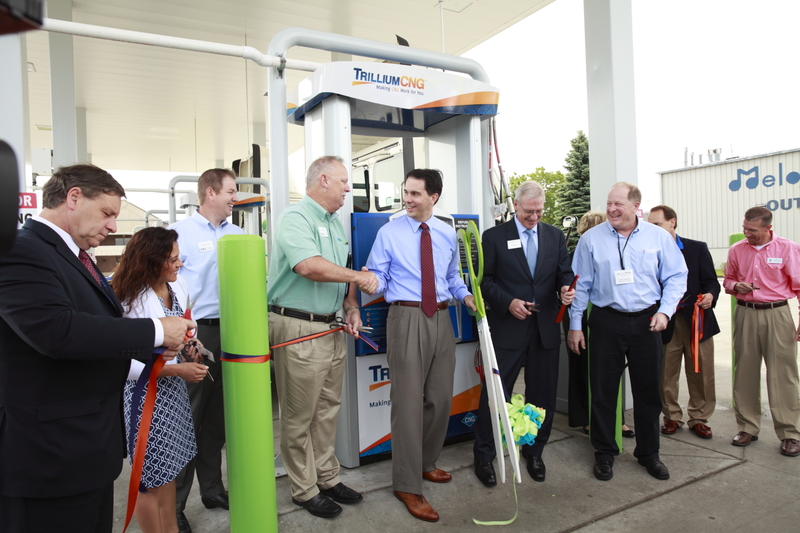 EVO CNG has partnered with Trillium CNG for all of the operations and maintenance at its stations. We monitor all stations live 24/7 and know exactly how each station is running all the time. We offer this same monitoring capability to our customers giving our customers live 24/7 access to view the station status via our Internet portal. EVO CNG has an established and growing national network. EVO CNG with its partner Trillium CNG has over 50 public access stations across the country and over 100 under operational management. This means that no matter where you are headed, EVO Trillium will likely have an operating station or one that is planned. We can work with you to plan your routes to take advantage of the pricing and consistent quality fill at any of our stations. EVO CNG has relationships with other fuel station owners. EVO has relationships with most of the fuel station builders across the nation. If we don’t have a station in an area where you need it, we can still help you by directing you to the closest station even if it isn’t one of our own. We want to be your complete solution even if that solution involves fueling outside of our network.